This wasn’t the post I had planned. Not by a long shot. I even had a photo for my post from today taken and everything. But that changed about 11:10 this morning. My students were working on a review game, using an iPad app to quiz themselves. I looked up from one of their tablets and saw a friend at the door, so I went over to see what he needed since he teaches on a different floor. Great, I thought, I can show him the app and see what he thinks. But I wasn’t prepared for a crying student to be standing with him. Last year, I had a student who transferred to our team from another one on our floor. She came in knowing our kids but unsure how she fit in with them. Slowly, things started to gel, and we figured out that this kid was a hardworking young lady, who had a rather tough exterior but a tender heart. She laughed. She raised her hand. She tried. And she got pissed when kids teased her. Sadly, she did a fair amount of teasing herself – seventh graders are kids, after all – and when it came back around, she didn’t handle it very well. But through it all, she was awesome. Before our standardized tests, I would remind the kids of all the tricks that they had learned. Jot stuff down. Highlight the important information. Be sure you are trying your best because you are awesome. 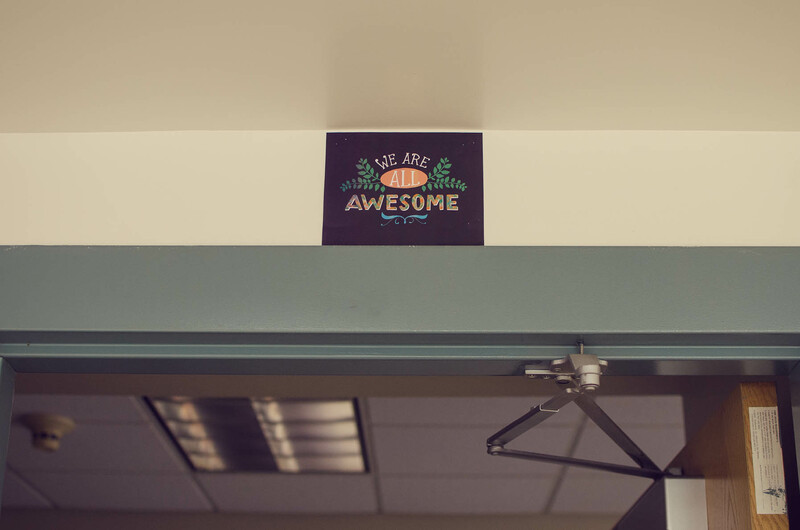 Every day during the test, that became our motto: you are awesome. Why are we doing this? Because you are awesome. We’re closing the books like this why? Because you are awesome. I can keep the pencil and highlighter? Sure . . . you are awesome. When my group from last year made their trip upstairs, I knew she would be in good hands because I had someone to “pass her on to” on her new team. Sometimes, you meet a kid who frightens you because you know damn well that they could take a left turn and wind up being the king of the world but a right turn would land them some place scary and depressing and with no way out. This kid frightens me because that turn could go either way. And for the first quarter, she was doing fine. I’d check in on her progress on bus duty, and my friend would assure me that she was doing well. She popped in a few times in homeroom to say hi and tell me that she was loving 8th grade. We’d wave in the hallway. I’d remind her that she’s awesome. But today, she was in tears forgetting how damn awesome she was. Even after our talk, I’m not sure she believed me . . . because she’s upset. Feeling left out. Like no one will listen to her or talk to her. Tired of people making fun of her. Just tired. She’s awesome – always has been, always will be. I think she just needs someone to remind her how awesome she is. Then again, we all do. So today, today I am grateful for this kid and all the other ones like her to remind me that we are all awesome. this gives me real hope, real pause, and real angst about the way the world can be such an unknown. loved reading it. It’s an ever changing place. I’m just hoping that our kiddos are ready for it and vice versa.